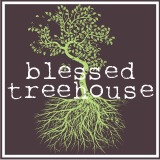 Blessed Treehouse: That's my baby?! It's been an entire year since these pictures were taken. I hardly remember those days. Thank you, Jesus, for digital photography.